Was there anything hotter than Wonder Woman this summer? The sun didn't even come close, no matter what James Cameron might think of the movie. And Warner Bros. knows it has a phenomenon on its hands. As evident in a new sneak peek video at their upcoming animated adventure The LEGO Ninjago Movie. Wonder Woman gets a cameo while other girl-centric DC heroes get a shoutout.
" target="_blank">Warner Bros. ever-expanding Lego Cinematic Universe. It follows The Lego Movie and Lego Batman, which were two huge hits for the studio. Now comes Lego Ninjago, which is based on the toyline of the same name which comes from Lego. This preview is all about going back to school, which is on the minds of most kids at the moment. The movie follows a secret ninja team who are tasked with saving the world from the evil Garmadon (Justin Theroux). Here, we're introduced to female warrior Nya (voiced by Abbi Jacobson). Though she's been tasked with saving the world, she also has to head back to class. She offers wannabe ninjas some sage-like advice. And clues everyone into the qualities needed to be a true hero. Ninja believe in strength, power, and confidence. But she's not above the average teenager. She likes taping things up in her locker, too. And these include pictures of other heroes. Including Wonder Woman. Others who get locker worship include Wyldstyle and Unikitty from The LEGO Movie and Batgirl from The LEGO Batman Movie. As the video hums along. Nya also overs up some make-up tips to cross-match with camo. She also shows off the secret passage way inside her locker that leads to a lair where powerful, crime-fighting mech suits are kept hidden away. As Nya puts it, anyone can be a ninja. And anyone can save the world. But don't let your education suffer for your efforts. This fun video is set to coincide with the new fall school year, and should help the worry of retuning to those hallowed halls of your alma mater. Back to School is an event that happens all over the country, for pretty much everyone. So it's an identifiable worry to hang a little humor on. And it may be comforting for kids to know that those in the Lego universe have the same worries and cares. 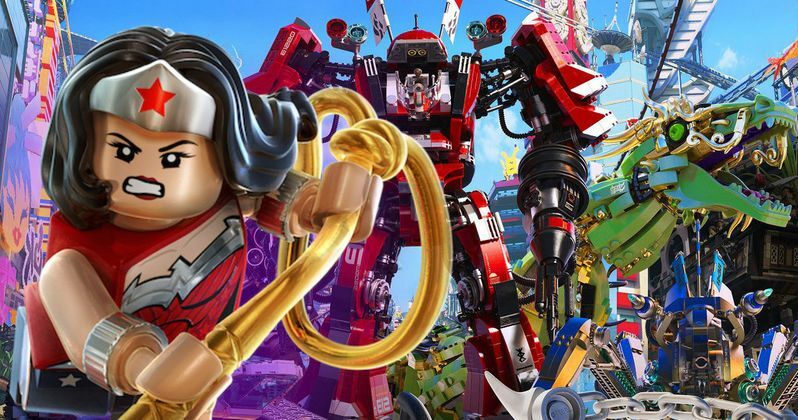 The Lego Ninjago voice cast includes Jackie Chan as Master Wu, Dave Franco as Lloyd, Michael Peña as Kai, Abbi Jacobson as Nya, Kumail Ninjiani as Jay, Zach Woods as Zane and Fred Armisen as Cole. Here's the official synopsis for the movie as released by Warner Bros.
"Inspired by the wildly popular LEGO line of toys, Ninjago is the story of six young ninja tasked with defending their island home, called Ninjago. By night, they're gifted warriors, using their skills and awesome fleet of vehicles to fight villains and monsters. By day, they're ordinary teens struggling against their greatest enemy: high school." This latest Lego adventure will be in theaters September 22, 2017. Take a look as Nya heads back to school while juggling her hero duties, just like most average kids her age.